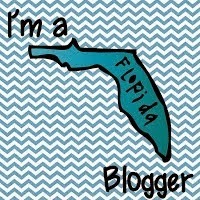 I have been tinkering with my blog this summer. I updated my Social Media buttons on the right. I also added some pages and navigation bar links below the title. Next I turned my attention to my Teachers Pay Teachers store. 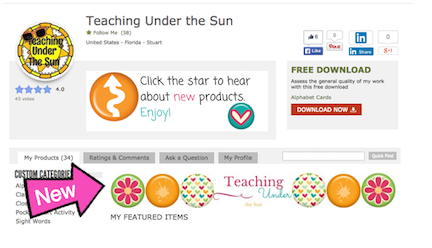 I used the tutorial "How to Dress Up Your TpT Store!" Found on Mrs. Fultz's corner. I do not see any reason to reinvent the wheel and there are so many kind bloggers who share tutorials. I always start with a Google search. I used Canva, the online platform for design, to create a new 'quote'. My quote doesn't link to products. This is where I diverged from Mrs. Fultz's tutorial. After creating the image in Canva, I downloaded it to my computer. I then added it to my blog. I have an unpublished page of images so I can grab the HTML codes. I previously used Photobucket, but my account was having issues. After getting the HTML code I logged into my TPT account. Under the Seller's Dashboard, click on Edit Profile. Paste the HTML code into the Personal Quote box and save. My old banner doesn't match my new quote. 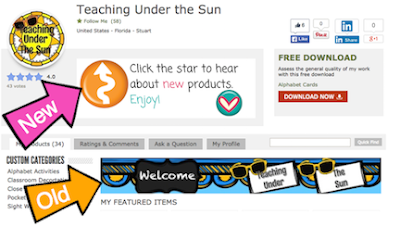 Back to Google and I found this tutorial at Tales from a Very Busy Teacher to spruce up your TPT banner. I went back to Canva and voila and new banner in no time at all. I have uploaded many of the design elements I use on my blog to my Canva account so I can keep a uniform theme and color scheme throughout. I used papers and clip art designed by KHDigi on Etsy. She had great work and good prices. Check her out. I think I have gotten everything updated and tweaked this summer. I could play with design all day, I often tell myself to stop. Don't be afraid to dress up your store. If you get stuck, directions are usually just a Google search away.